'John Deere' or 'huge deer'? Apparently it's hard to tell. Did a moose kill that woman, or was it a lawnmower? In Sweden, it turns out, that’s a question that sometimes has to be asked, according to a case report published in the Journal of Forensic Sciences on Tuesday. The report details how Swedish police misattributed an attack by the largest member of the deer family to a human killer driving a lawnmower. Are Swedish police just terrible at their jobs, or do moose and lawnmowers have more in common than we think? Well, try to imagine the situation: A woman in her 60s walked with her dogs into the woods. When she didn’t return, her spouse went looking for her and found her dead in the wet earth by a lake. Her injuries were horrible — a long slash cut deep into the muscle of her leg, from hip to knee. Further extensive wounds covered her exposed torso and limbs. Her clothes were torn. Investigators found bits of short hair on her face and a smashed-up log nearby. To the police, the situation seemed suspicious: All signs seemed to point to foul play by another person with a sharp object, not a huge animal pounding with blunt hooves. They reasoned that, because there wasn’t a lot of blood left in the churned-up, moist dirt of the lakeside, and because initial tests suggested the bits of hair might have come from a boar, the woman had been attacked with a lawnmower elsewhere, then hauled to the water. And the truck used to haul her must have previously been used to haul a boar killed on a hunt. It made sense, though their explanation seemed forced. But further examination and analysis of the deep cuts vindicated the lawnmower. Ultimately, her cause of death turned out to be a crush injury known as “flail chest,” which is when the ribs snap under pressure, preventing normal breathing. Unless the riding lawnmower toppled over on her after cutting her, it’s unlikely that it was the culprit. 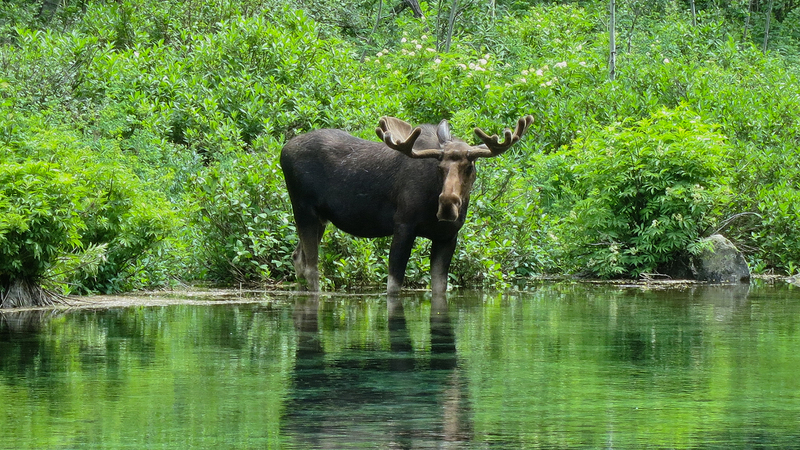 A wild bull moose (technically known as an elk in Europe) can grow up to seven feet at the shoulder and 10 feet long, weighing more than 1,500 pounds with a six-foot antler-span. But when they kill people, the investigators note, its usually by accident, in a car crash. The forensic team was back to square one: Was a wild boar to blame? No, a boar would have kept attacking once she’d toppled over, leading to more cuts on the torso. The key to solving the case, it seemed, was in the hair found on the body. DNA tests on those strands revealed all. The story was beginning to make sense. It was almost the start of rutting season, so it made sense that moose were violent. Once they were called in, moose experts predicted that investigators would find saliva on the woman’s clothes, from when it ducked to gore her in bowling her over. They did. Piecing together the evidence, they concluded on a narrative: At some point along the walk, the poor woman’s dog stumbled across and enraged a moose, which gave chase. The dog ran back toward the woman for protection, and the moose followed, knocking into her and tangling its antlers in the waistline of her trousers. When it jerked its head and dragged her to free itself, her pants cut into her legs, leaving the long gash. The other damage was the result of stomping and goring her against the log. Big, non-poisonous animal attacks are very rare, they write, especially in the northern hemisphere. But they do happen, and when they do, forensic investigators ought to be prepared — else they confuse a moose and a riding lawnmower.